My name is George Schoepf, I was born in Switzerland, but fourteen years ago, I settled down in the city of Perth in Australia and since then have worked as an artist in this country. For more details please click on the links below to read my curriculum. Now I would like to ask you to view a small selection of my work. Your opinion will be much appreciated. If you live in Perth or live in the Eastern States or abroad, but intend to spend sometime in this Western Australian city, you are welcome to visit my studio. To get in touch with me, please contact me via E-Mail. 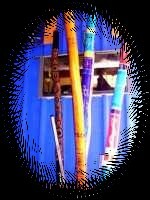 Do not forget to visit my special page on Didgeridoos. Click HERE for more details or on the icon and other links.